Democracy is often messy. Yet out of the mess of the past month or so has emerged a victory for those who believe that the people of this country need to have all their health care needs addressed with the help and financial support of the government. I confess to being greatly relieved by this turn of events because a) it validates all the time and energy I’ve put into sending emails to local politicians; signing petitions; forwarding information to friends; b) it means we’ve all made a difference through our efforts and that is so rewarding. If you are not of the same persuasion, you may not agree with the rest of what I have to say. But we do need to listen to one another, so I hope you’ll finish reading my post. Today I got back into the political arena by attending a meeting of the Huntington Town Democratic Committee at a nearby American Legion Hall. On a Saturday morning, there were about 50 people in attendance; most of them middle-aged or older. I saw some of my friends from the senior activist group I’ve joined, the Indivisibles. I was happy to see my fellow super seniors out there beating the bushes. He explained that our challenge now is to persuade the 10-20% of noncommitted voters to “work with us.” And that is hard work, he said. And it takes time…a lot of time. 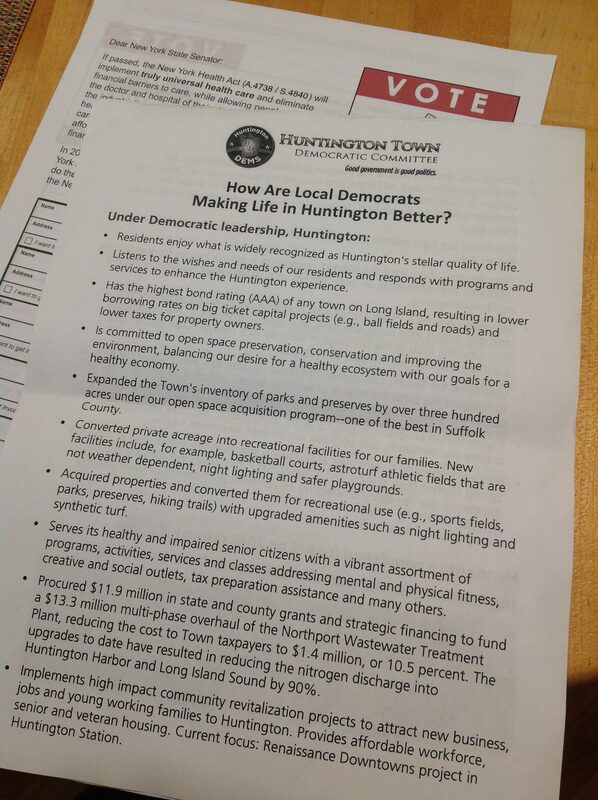 We were given a handout highlighting the things the Democratic Party has done to improve life in our town. He outlined his plan for organizing. He is taking his District 3 area and dividing it into 16 parts; he will be holding a town-hall meeting in each of them to start the recruiting and organizing process. He emphasized that we have to start by working on the local elections and turn things around. Another person spoke about canvassing door-to-door and how it’s actually very interesting work to meet the people in your neighborhood and actually talk to one another. It’s not easy, he said in agreement with our Representative, but it’s very fulfilling work. One person from the audience suggested that the Dems now need to be more aggressive about their own agenda, since the Republicans can’t seem to come with one they can agree upon. I think she’s right, and I hope that is some of the work the Democratic Party is currently engaged in. 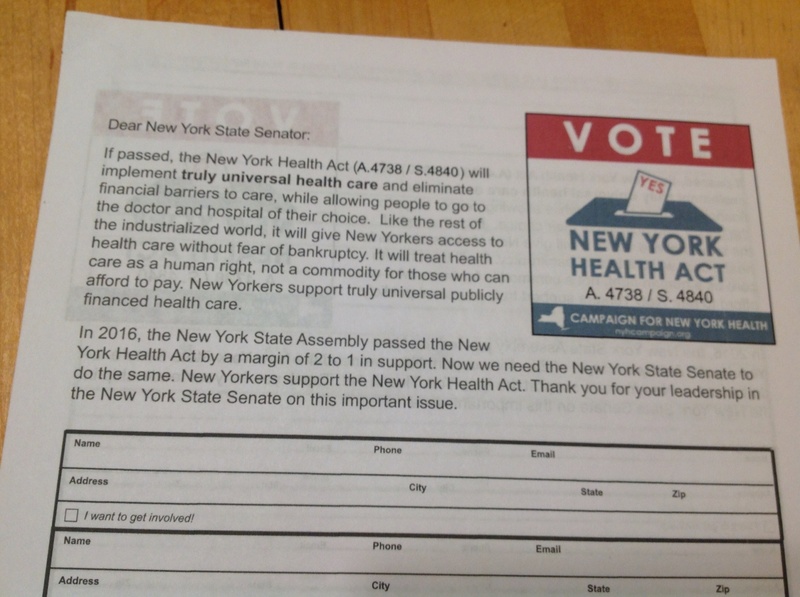 I took a couple of petitions for people to sign to encourage our NY State Senators to adopt a single-payer health plan which is called the New York Health Act. I will share them with my yoga class participants. When I got home I felt good to have been part of the action the past few months and to see such encouraging results. But the real work lies in the weeks, months and years ahead for all of us who are unhappy with the way things are. You’ve been busy and productive during your retirement. Must be so nice to feel you’re doing something that you believe in and that makes a difference. It “feels like” I have no choice. I can’t complain if I don’t offer my help to change the status quo. This is too important…. Change happens when people take positive action instead of complaining. You make a difference. I am doing what I can to try to be positive because I do not believe in just complaining. Thank you. — Kevin, lifting lines for poems as comments. Kevin, this poem is incredible and should be shared widely!!! Love how you “lifted” lines and created your own version of how change happens. I’ll have to try that myself. Love how you “lifted” lines and created your own version of how change happens. I’ll have to try that myself. Nice poem. Barbara- I am so proud of you!! Thanks, Kathleen. At this point in my life I can’t stand by and watch our country being pulled apart in this way, and our values trampled on. I have two young adults who have to live many more years in this crazy world, and I feel for them and everyone else who’ll be left with this mess. Good for you for getting involved. The key for me is to have a plan. How can you try to get rid of something when you have nothing to replace it with? If you can’t agree on something in your own house how do you expect others to go along with what you are saying? Yes, there is lots to be done and this is a good first step. I completely agree…without a plan, why even bother. But I think the Dems learned a hard lesson this time around, and are beginning to strategize better. The only positive thing to come out of this election is the activism of the here to fore complacent progressive wing of this country. Friday was a victory, but a temporary one – Trump will attack the ACA through regulations (the HHS), so we must remain engaged and active. I have hope that yes, we can! You are right about Trump. He won’t let this lie, even ‘tho he is pretending to be “over it.” Revenge is his operative word: it’s just a matter of time. So glad to know you’re in the fight. Listening is the most important thing the politicians can do. They need to listen to what the people are saying. I wish every elected official would have only the health care benefits that the majority of the citizens have. Stay strong, you make a difference. Listening to “the people” is important, depending on who “the people” are. There are an awful lot of them out there I will never agree with. I do try, in my own way to “listen” to what’s going on, but in the end I trust my instincts. Thanks for the encouragement…it’s important. That’s all I got here….you are being the change you want to see in the world, and that works for me! Yes, I’ve really been feeling that expression very deeply lately. You’re welcome! Kevin, you did more than that…you made them sing! See my comment today on your blog. I am awed by your talent and generosity. Yes, it is good to have so many people involved in the political process, and yes, it’s validating to think that some of our efforts have led to 45 having difficulties getting his agenda pushed through. But how this happened and how to move forward constructively, impactfully, and respectfully will continue to challenge our country at all levels. Thank you for all you are doing. I SO appreciate it. And I will continue to fight for change as long as I can because I hate seeing what has happened to our country. There are lots of amazing people out there who feel the same way. You’re welcome.